Today I am going to share with you some of my first grade first day activities that we do using The First Grade Measuring Stick. I hope you love it as much as my kiddos’ parents and I do! I cannot believe the first day of school is only a day away. The summers just keep getting shorter. Our first day of school is all about Open House… which is held in May. Yeah, truly – it is all about Open House. We spend the day doing things we will be doing again in May… and I LOVE it. It all leads to our “Sea How I’ve Grown” keepsake. These photos are great indicators as to how much they have actually PHYSICALLY grown. 1st grade is an amazing time of change! I also add in their entry and exiting reading level on this sheet. It servers as the cover for their work that is stapled behind each photo. They do the exact same assignments on the few days of school, and then again in May. Stapled beside each other, they offer a side-by-side comparison exhibition of a year’s growth. This kiddo did pretty good in August. most tend to draw stick figures or bodies without clothing. Not only do they grow physically and academically, but creatively as well! Behind those pages I add their “Neatest Printing” and writing prompt. 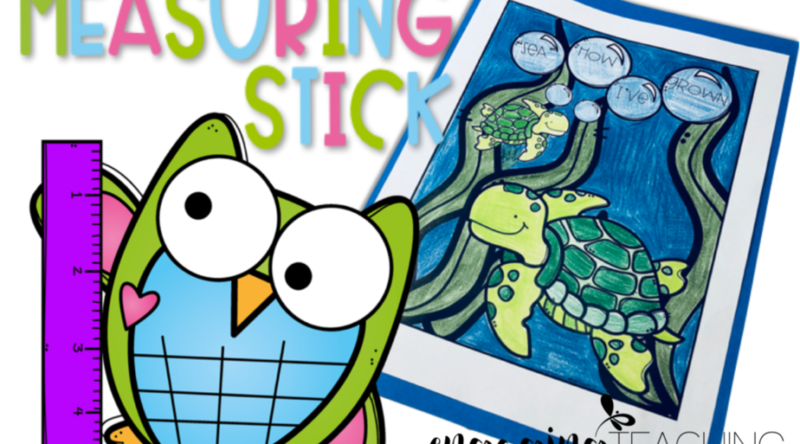 The pages in The First Grade Measuring Stick have been updated since these photos were taken, but the concept remains the same. Copy some pre-written text (that includes all of the letter of the alphabet) in your neatest possible handwriting. This is always a huge hit. They growth is amazing. Usually the thing that I am most over the moon about, though, is their writing prompt. About 95% of the class writes a sentence maybe two in August. Many just a word or two. But in May?! Oh my goodness it’s incredible. That same 95% usually write a two page story with adjectives, direction, and creativity in May! Also included are the words and numbers I know pages! The kiddos write as many words as they can think of on the Words I Know page. It’s 2-sided. Usually a line or two is completed in August and both sides are completed in May! Often, the kids can complete most of the numbers on the 120 chart when they enter, but with a few mistakes. By the end, they whiz through it AND complete the skip-counting portion on the back! Additionally, there is a math assessment that I include. It covers all of the 1st grade standards. For the most part, the kiddos leave it blank in August. A few attempt to answer some of the questions, but skip most. I tell them that it is completely ok to skip any of the questions because they haven’t been taught it yet. You definitely don’t want them totally stressed out the first day! I let them know that these pages (all of them) are just for me to know what they know and to see what I need to teach. Reminding them that I don’t expect them to know any of this stuff yet, so it is totally ok to skip things certainly relaxes them. That way, I avoid any stressed out tears. In May, however, I tell them that these pages encompass everything they have learned so it is time to really show off how much schema is in those fabulous brains of theirs! They never disappoint and always do a fantastic job on all of the pages. I usually encourage it by showing an example or two of how little they did when they first arrived (no names, of course) so they know how well they can demonstrate their knowledge. I only have to save this one set of work in their folder for this end of the year powerful growth exhibit. It’s easy and makes evident all of the tremendous growth. It is also an amazing testimony that all children do indeed grow. Even the folder for my most challenged, struggling students shows incredible growth. When the parents flip through those pages and compare where their child was to where their child wound up they get the full appreciation for what we know as teachers to be the phenomenal grade level that is first grade. The First Grade Measuring stick includes detailed instructions and a description on how I implement it in my room. These first grade first day activities also make easing back into school a little easier, too! The assessments are quick and provide a whole lot of starting data. I just love having such clear and demonstrative data about my students’ growth throughout the year. When you pull out the beginning of the year samples and lay them beside the end of year samples, it is such an uplifting moment. I’m excited to meet my 30 new little peeps tomorrow – but I sure would have loved just one more week of no schedule and no alarm. Morning is going to come WAY too soon. Have a great Monday, peeps! So cute!!!!!!!!!!!!! I love it!! I love the visual! Have a wonderful first day tomorrow!!! Thanks so much for the "measuring stick"! I have been looking for something along those lines! Traci! You are SO generous! I do have to tell you that whenever I think about complaining about my class size, I think of you. I have 23 and I can't wrap my head around that so your 30 makes you Wonder Woman in my eyes. Good luck this year and I am excited about the Measuring stick activities! Thank you, Thank you for the FB freebie!! Love your blog! Thank you SO much for the measuring stick freebie!! Have a great school year! I love your keepsake idea. Am I too late for the FB freebie? I didn't see it listed on the Fan Exclusive page. Thanks. Yes, the flash freebie is over. The pack is available for $2 in my stores, though.